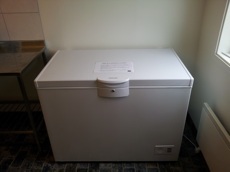 We've now put a freezer in the fish cleaning room, in which you can store your catches. You can still store them at Stefan's fishing store. All catches must be put in a plastic bag, which the angler brings himself. Catches that aren’t put in a plastic bag, will be confiscated by Laholms Laxfiske. Don’t forget to tie/tape the opening of the bag, and put a note on it with your name and fishing license number. Laholms Laxfiske will not take responsibility for any missing catches from the freezer. The room is locked at 7 pm, every day. Something to keep in mind in case you've got a catch in the freezer.